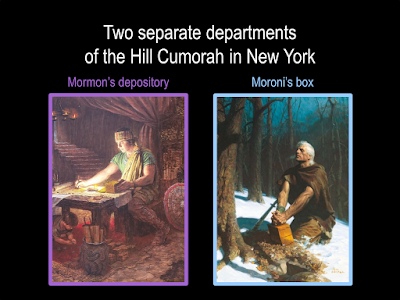 I find that many members of the Church are unaware of Mormon's repository of records in the Hill Cumorah in New York, so I'm reviewing that here. In Letter VII, Oliver Cowdery wrote that Mormon, "by divine appointment, abridged from those [Nephite] records, in his own style and language, a short account of the more important and prominent items, from the days of Lehi to his own time, after which he deposited, as he says, on the 529th page, [now Mormon 6:6] all the records in this same hill, Cumorah and after gave his small record to his son Moroni, who, as appears from the same, finished, after witnessing the extinction of his people as a nation." How did Oliver know that the Hill Cumorah in New York was the one Mormon described in Mormon 6:6? Was he just speculating, as many of our LDS scholars and educators claim? Orson Pratt and others explained there were two separate departments in the Hill Cumorah in New York. "I lived right in the country where the plates were found from which the Book of Mormon was translated, and I know a great many things pertaining to that country. "I believe I will take the liberty to tell you of another circumstance that will be as marvelous as anything can be. This is an incident in the life of Oliver Cowdery, but he did not take the liberty of telling such things in meeting as I take. I tell these things to you, and I have a motive for doing so. I want to carry them to the ears of my brethren and sisters, and to the children also, that they may grow to an understanding of some things that seem to be entirely hidden from the human family. Oliver Cowdery went with the Prophet Joseph when he deposited these plates. Joseph did not translate all of the plates; there was a portion of them sealed, which you can learn from the Book of Doctrine and Covenants. When Joseph got the plates, the angel instructed him to carry them back to the hill Cumorah, which he did. Oliver says that when Joseph and Oliver went there, the hill opened, and they walked into a cave, in which there was a large and spacious room. He says he did not think, at the time, whether they had the light of the sun or artificial light; but that it was just as light as day. They laid the plates on a table; it was a large table that stood in the room. Under this table there was a pile of plates as much as two feet high, and there were altogether in this room more plates than probably many wagon loads; they were piled up in the corners and along the walls. I tell you this as coming not only from Oliver Cowdery, but others who were familiar with it, and who understood it just as well as we understand coming to this meeting, enjoying the day, and by and by we separate and go away, forgetting most of what is said, but remembering some things. So is it with other circumstances in life. I relate this to you, and I want you to understand it. I take this liberty of referring to those things so that they will not be forgotten and lost. Carlos Smith was a young man of as much veracity as any young man we had, and he was a witness to these things. Samuel Smith saw some things, Hyrum saw a good many things, but Joseph was the leader. Now, you may think I am unwise in publicly telling these things, thinking perhaps I should preserve them in my own breast; but such is not my mind. I would like the people called Latter-day Saints to understand some little things with regard to the workings and dealings of the Lord with his people here upon the earth. Now, what do our scholars and educators say about the repository? I've spoken to FairMormon about this but they refuse to change the article or add additional material to it, so I think it's important for people to know what they're doing. They quote part of Brigham Young's sermon, omitting the part about other witnesses to the site and Brigham's emphasis that he did not want this account to be forgotten and lost. As mentioned previously, the Hill Cumorah located in New York state is a drumlin: this means it is a pile of gravel scraped together by an ancient glacier. The geologic unlikelihood of a cave existing within the hill such as the one described suggests that the experience related by the various witnesses was most likely a vision, or a divine transportation to another locale (as with Nephi's experience in 1 Nephi 11:1). [Of course, this theory is rebutted by the discovery of an actual room in the Hill Cumorah that matches the description, but let's set that aside to consider the reasoning here. Brigham and the others spoke of a room. Mormon says he deposited all the records, a point Oliver verified in Letter VII. Because these accounts contradict the two-Cumorahs and Mesoamerican theories, our LDS scholars and educators seize upon Brigham's use of the term "cave" and insist it must refer to a "natural cave," even though the term applies to both natural and artificial (man-made) caves. Then they claim Oliver, Don Carlos, and the others who personally knew about the repository, as well as Brigham Young who heard about it, must have been relating some sort of mass "vision" or, even better, "a divine transportation to another locale." And this happened not only once, with multiple people, but multiple times. And this happened after the angel told Joseph to "carry [the plates] back to the hill Cumorah." One of many obvious questions is, why did Joseph, Oliver, Don Carlos, Hyrum and others have to be teleported to Mexico? Why didn't the angel just teleport the plates? For that matter, why did the angel tell Joseph to carry the plates "back to the hill Cumorah" if Joseph was going to enjoy "divine transportation" to Mexico? The story of the cave full of plates inside the Hill Cumorah in New York is often given as evidence that it is, indeed, the hill where Mormon hid the plates. Yorgason quotes one version of the story from Brigham Young and alludes to six others collected by Paul T. Smith. Unfortunately, none of the accounts is firsthand. and all those who have gone in search of the cave have come back empty-handed. If, therefore, the story attributed to Oliver Cowdery (by others) is true, then the visits to the cave perhaps represent visions, perhaps of some far distant hill, not physical events. [This might be my favorite spin of all. I'd like to see documentation for when "Moroni had retrieved the plates from Joseph several times previously." The only two times I'm aware of where after the 116 pages were lost, and before Joseph left Harmony. We don't know it was Moroni to whom Joseph gave them before he left Harmony, although some assume it was. But this was not a magical, "divine" transportation event. They met the messenger along the road to Fayette. He had the plates in his knapsack. He was physically carrying them back to Cumorah. I realize the Mesomanics want you to think these plates could be magically transported from Mexico to Palmyra, willy nilly, because they can't otherwise explain these incidents in Church history. But that theory contradicts the text of the Book of Mormon as well as Letter VII and all the other accounts in Church history. If the plates (and other artifacts) were so easily transported, why did Moroni have to build a box of stone and cement and bury them all the way in New York 1400 years before Joseph could get them?